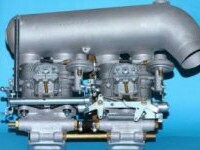 These second-stage vacuum-controlled, horizontal twin-choke carburetters are the predecessors of the later INAT models- 230 and 250- series. 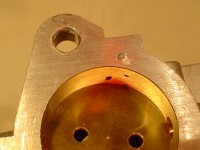 As the throttle spindle of the second stage wears, the disc tends to chatter in the bore and a slight ridge is formed. As wear progresses, the disc does not seat properly, and rogue mixture creeps past causing a high tickover, increasing as the wear increases. Repair-welded, fettled, bored out and with new oversize disc. Damage about the periphery of the securing bolts (inlet-manifold flange) is repaired with the use of special filling-rods using the equipotential shielded-arc method, finally being machined to original specification. Further damage is prevented by the use of special steel thrust washers, included with every set-up. The only way to save these original, rare bodies, is to bore them out to a diameter of Ø44,5mm (if that is not enough Ø45mm) and have oversize discs made, similar to Porsche 40PII. As it´s very difficult to fit the support tube between the air-collector box and the engine-block, the easiest solution is to leave it out – here´s the result. Check the flange for hair-line cracks, or if the flange is broken off as here, as they are irreparable if this is the case! Another problem that arises with this series, are the spindle lip seals fitted to the first stage. As the carbs are mounted directly above the exhaust manifold, they get extremely hot, and these seals, manufactured out of thermoplastic, break down, crack and are useless after a short time (about 5000 km.). 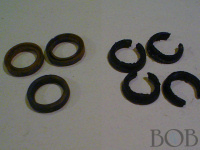 The seals on the left are from a standard Solex downdraught carb and the ones on the right from a 190 SL. I don´t use these seals any more, and have the advantage that I use the existing seal-groove for wider bushes(about 33% wider) improving wearing coefficiency - my spindles are hard-chrome plated (basically wear-free) anyway. Don't forget to check the throttle slave-shaft, complete with the two short connecting-rods, ball-heads and ball-cups. Sometimes the two small return-springs (accelerator-pump) are not strong enough to return these throttle-levers to the tickover position. 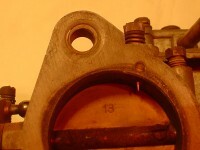 This is only achieved by the long return spring, which connects the throttle slave-shaft to the air-collector box. 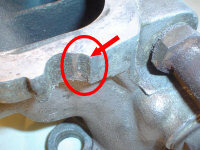 This means that when the throttle slave-shaft, ball-cups and ball-heads are worn, it`s possible, that the second carburetter throttle-lever doesn`t close properly. This leads to a very unsteady tickover, and it's not possible to synchronise the carburetters. 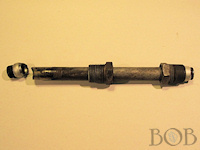 If this is the case, I can newly overhaul the throttle slave-shaft and connecting-rods: the carrier tube is cleaned and fitted with new bushes and the worn shaft is replaced with a new one made of silver-steel (extremely wear-resistant). 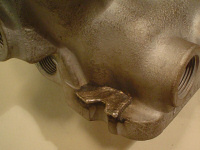 The connecting-eye for the large return-spring is also rewelded and fettled clean or replaced. 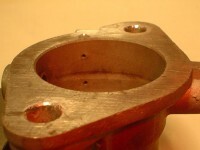 All ferrous-parts are electricly galvanised, all ball-heads and cups are replaced, and also the short connecting-rods are regalvanised. Now you can synchronise the carburetters properly. It`s also possible to overhaul the complete inlet-system (please check archive). 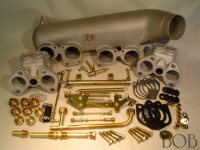 The two aluminium inlet-manifolds and air-collector box are bead-blasted (as with carburetters), and all the steel threaded unions and connecting-pieces are removed (drilled or sawn) as these are normally rusted solid. 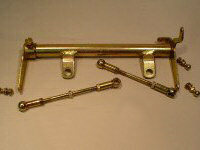 These are all replaced by high quality brass threaded unions, which will not rust again. These are even cheaper than steel threaded unions, but they can be removed at any time, preventing the aluminium inlet manifolds being damaged. The hot-start mechanism and bell-crank (under the front carburetter) can also be overhauled in a similar way as the slave-shaft, i. e. newly bushed and galvanised. Due to the rough-running of the engine (only 3 main bearings) the inlet-manifolds and exhaust-manifold are prone to loosening. 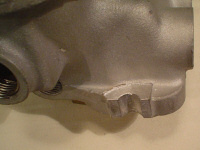 The damaged aluminium manifolds can be welded and machined. Costs about 60,-Euro for the damage in the foto. 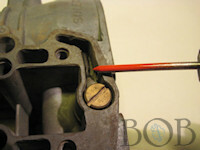 Don't forget: Check the mating surface on the cylinder-head. 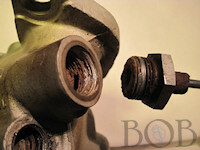 The threaded steel-ferrules may sometimes rust solid and this is the result when they are removed. 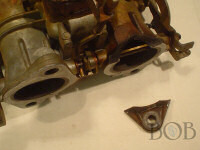 These can be repaired by the use of Helicoil-inserts – check pricelist. Furthermore, I can offer new solid-brass ferrules – check price-list - which are guaranteed never to rust again. Due to the use of oversize 6mm studs, the injector-tube can be crushed and no more fuel can pass. These may be repaired through the use of new tubes being silver-soldered into place. Always check that the pre-emulsifier securing screws are tight, otherwise such damage may occur. This is repairable through use of a spezial miller head – see price list. It´s essential to check the vacuum pipe isn´t fractured (that sits between the inlet manifolds) – this can lead to serious induction of false air. A detailed working-plan and adjusting instructions are supplied with every set-up, to help final tuning at home.